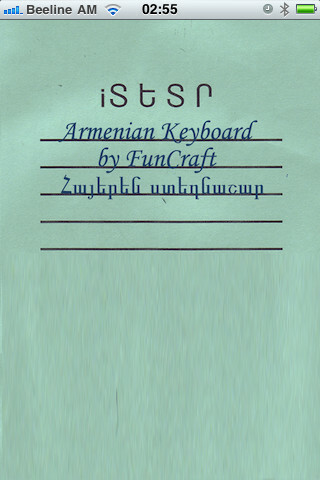 Much to the delight of fans wanting to communicate in Armenian on their iPhone, iPad and iPod Touch, U.S-based app workshop FunCraft has released the iTetr Armenian Keyboard, available for download on iTunes for $1.99. Designed in a style reminiscent of Soviet Armenian copy books, iTetr allows users to write in Armenian for texting, tweeting and Facebook, according to a statement released by FunCraft. 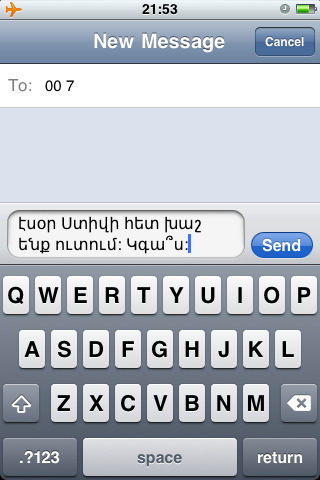 The app also uses a phonetic keyboard layout and has options for email, saving notes and language changes. Customers who bought iTetr have been leaving positive feedback on its iTunes Store page with minor complaints, expressing their gratitude after. 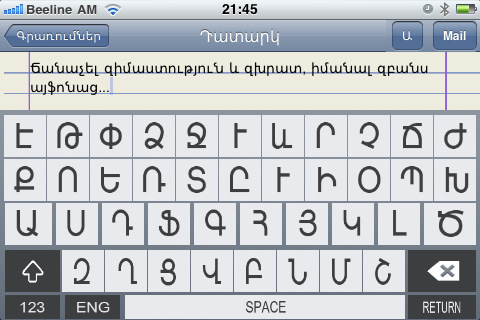 Around 40 Armenian-themed apps are available for purchase on iTunes, including iTrek – Armenian Phrasebook, English-Armenian dictionaries, the Genocide Monument app and Armenian Legends and Poems.